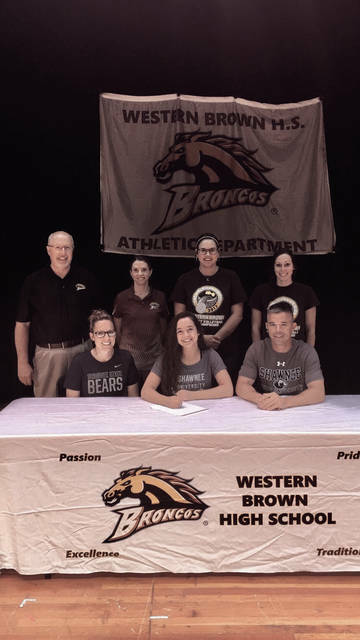 Western Brown’s Emily Cooper signed with the Shawnee State University volleyball program, as announced on Tuesday afternoon by the athletic department. Postseason play for the Gene Bennett Baseball Classic will start at 9 a.m. on Saturday. A full schedule will be included online and for Saturday’s paper as it is made available. On Tuesday afternoon, the Shawnee State University volleyball program announced another addition to its 2018 roster as the Bears signed a defensive specialist in Western Brown High School’s Emily Cooper, a setter who will be suiting up for Susan Shelton’s unit from the Fall of 2018 on forward. During Cooper’s career at Western Brown, she received two All-Southern Buckeye Conference (SBC) first-team awards, and a OHSAA Division II, District 13 All-City third-team award. Cooper lead the Broncos to two SBC titles and also became the all-time assist record holder with 748. The 5-4 Cooper will be able to contribute right away as the Bears ranked fifth in assists in the Mid-South Conference. Cooper will provide an offensive spark as a secondary setter, while also shoring up Shawnee State’s back line, where the Bears only ranked fifth in the conference in digs per set. To follow along with the rest of Shawnee State volleyball’s recruiting class go to ssubears.com.